I learned how to change a flat tire! I bought a Pro-Motion wetsuit in July but never had the chance to use it. I live in the city and pool swimming was oh so much closer. Then during my recent HIM, there were no suits allowed, and up at my friend's cottage, I didn't need one since the water was warm and pristine, easily seeing 5 or more feet down into the water. Not the case today. I would need a wetsuit. We had driven to Lake Carmine in Vermont, a favourite camping area from his past. KillerChops rowed me out to where the lake got deeper and past some of the nastier weeds. Time for me to slip into the water ... but I couldn't. I sat on the seat and realised what I was about to do and why. The thought hit me of how hard I had worked to get over my lifetime fear of water just to learn to swim and be able to attempt the Ironman. The fact that I was actually going to swim in my wetsuit for the first time made me realise moreso what I would be facing in one week. The horrible fear of water that I once knew suddenly flooded my mind. Frozen, I felt afraid again and started to cry. I took some deep slow breaths and slipped into the water and started swimming ... The water was heavy and thick and I could not see anything except dark green. No light penetrated the water. There were still lots of weeds until I got more into the middle of the lake. The waves were rough and very choppy since the wind was blowing easily at 40 km/h. I could feel my body jostled everywhere and my goggles got knocked off several times by waves crashing onto my face. Within 10 strokes, albeit sighting, my body was thrown into a whole new direction and my support boat became dangerously far. KC had a difficult time managing the wind and waves himself. I wanted to get back into the boat but I told myself I would need to learn to do this ... I ended up swimming for an hour and a half. Thank you KC and little C. for taking care of me in the water and never letting your eyes leave me. Thank you to my CR friends who have responded with such encouragement to my recent triumph in the water albeit such miserable conditions. 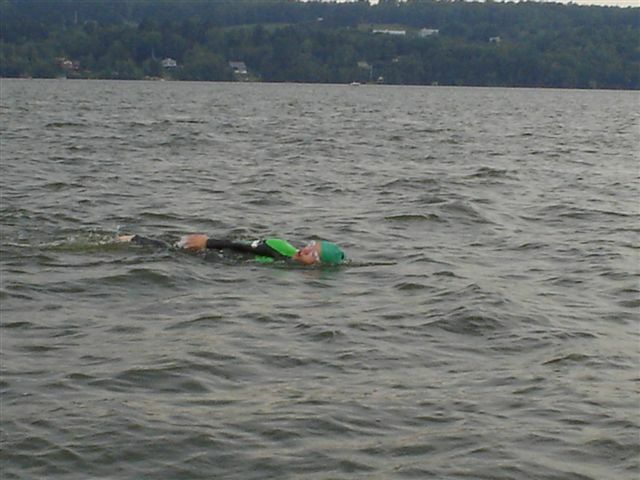 As KC said, if I was able to swim that long in such rough conditions, then everything else will be a breeze. I peeled off the wetsuit, tried to dry off a bit then put on my cycling gear. Today was a test off clothing ... I wanted to see how I would feel cycling with my wet cycling shorts on. It started to rain lightly, then within minutes, it was pouring. My planned half hour cycle on my mountain bike was quickly shortened to 20 minutes as the rain came down in torrents. I wasn't even this wet in the lake! 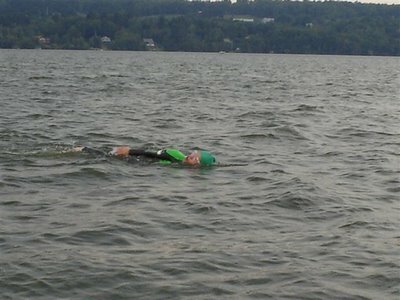 Felt good to change into some dry clothing and head home from Vermont except I felt a little off ... That little off became a lot off ... My ears had shooting pains and my shoulders and neck felt all achey - could this have been from the swim? I've never felt bad after a long swim. I ended up eating sparsely for supper as I had trouble staying vertical at times. Hope I'm not coming down with anything. posted by Silly Sally @ 11:49 p.m.